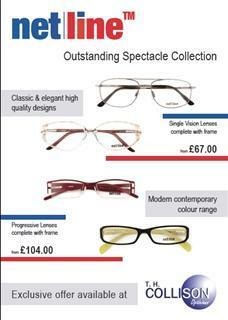 Thomas H. Collison Ltd are committed to providing quality eyewear at realistic prices. Value for money means different things to different people and we recognise that for some "the deal" is the clincher. That's why we have a range of all in one offers at all of our practices. Offering quality modern frames with standard lenses and all at highly competitive prices. Prices start from as little as £ 67.00 complete. Call into your local practice to see our full ranges.